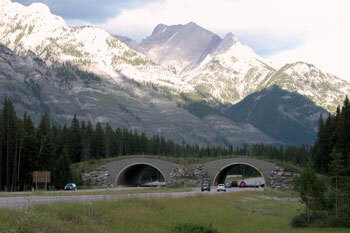 As you travel the Trans Canada, you will drive under two unique and wild-looking overpasses. These are links from one side of the highway to the other, which enable our wildlife to travel safely across highways here in the national park. You'll also notice fencing along the Trans Canada highway. Although this fencing has specifically been put in place for the protection of the wildlife, it does prevent the wildlife from traveling freely through the national park. Now because the Trans Canada is a major artery going across this nation from coast to coast, we don't have much of an alternative to this fencing. Every time we put a town site or roadway in place, we hinder the ability of the animals to function as they once did before man entered into the picture. These wildlife corridors vital to their survival are being disturbed. With these two animal overpasses in place, we hope to give the animals the space and thus the broadened gene pool and food they so desperately need to survive.